For the opening of its first Roastery in Italy, in Milan, Starbucks asked Accurat and MONOGRID to create an AR experience for the customers, crafted specifically to interact with the store's elements. 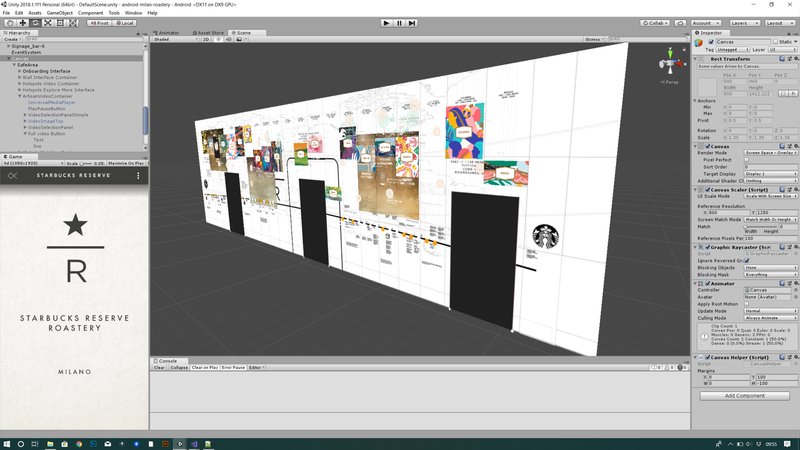 The app, developed with Unity, allows the user to explore the Roastery and browse through a series of contents related to Starbucks and its story. The main element of interaction of the app is the 18-meter bronze wall, located inside the Roastery: framing the wall, the user can see AR elements popping out. They offer additional informations about the mixtures of coffee produced by Starbucks and tell the story of the brand and his diffusion in the world. To encourage the speed and efficiency of the app, we have used a WebView system to display all the contents: the result is surprisingly fluid enough to seem a perfectly integrated system, even if it is external and independent. The app also uses the smartphone's gyroscope to access additional extra content. If you visit the Starbucks Roastery in Milan, you can find people drinking their coffee and having a chat, someone who is working on his laptop or eating a slice of cake, and there are some people having fun looking for markers in the space and playing with the AR elements: it is curious to see people moving their phone up and down discovering the story of Starbucks!